Take a look at this picture. That’s me, circa 1983. 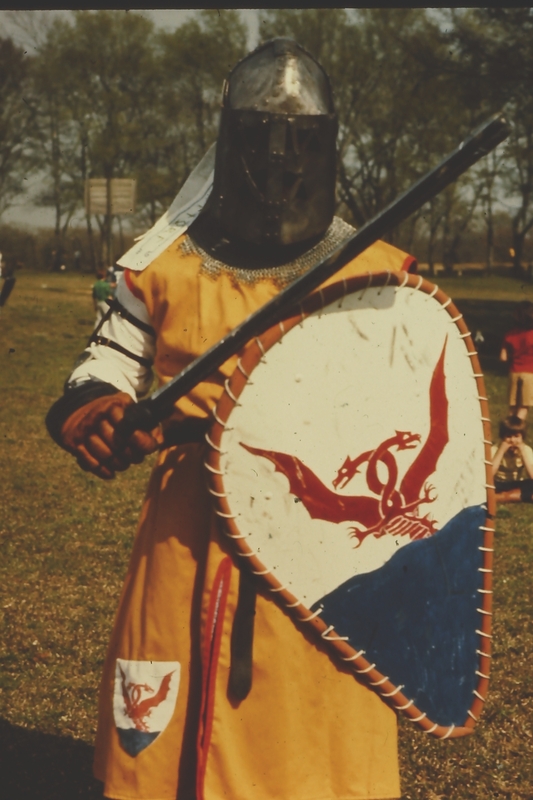 I was a member of a medievalist group called “The Society for Creative Anachronism®,” and that’s my fighter outfit for an afternoon of best friends beating on each other with rattan swords in a local park. The armor part of the outfit was no joke. The swords may not have had edges, but they were essentially clubs, and the pole arms were really big clubs. Bones got broken and teeth got knocked out in SCA fighter practices and tournaments. Not many, because the armor requirements were stringent and strictly enforced. It was supposed to be fun, and personal injury isn’t fun. Mostly it was fun. And research. Wearing padded gambesons and steel helmets gave one an idea, at least, of what it was like for knights and men-at-arms back in the day. Minus the element of terror and potential loss of life and limb, naturally. I may have been crazy, but I wasn’t stupid. I haven’t done SCA fighting in a long time. I did it for several years. Now and then I wonder why I stopped, but I don’t have to wonder for long. Just as when, as a kid, I was a big hunter. I was given my first shotgun when I was twelve, and I hunted in the woods surrounding our town every chance I got. I gave a lot of attention and effort to hunting, up until the day I realized that there were things I’d rather do, like go off to college and get on with my life. Rather like when I transitioned out of the SCA. It’s not that it stopped being fun, because there was always that element, even at those times when I got bruises on my bruises and had a brush or two with heat exhaustion (try wearing full armor on 90+ degree 80+ % humidity days and you’ll know what I mean). Regardless, things change. What a person thinks they want for a while might not turn out to be what they want forever. It usually isn’t. Fighting change is like fighting the tides. I look around at the state of the sf/f genre and publishing in general and I barely recognize it. When I was first coming on board, self-publishing was the kiss of death. It still can be, if you do it badly enough, but it’s not automatic. There are maybe six traditional publishing houses left that are still central to the field. There were once many more, with dozens of imprints. Smaller houses have come in to fill the niches, many of them very fine places to publish, or even have a career, but one thing they share with the larger publishing houses is that, barring a lightning strike, you’re not going to make a living writing for them. Exceptions? Sure. Lots. But they remain exceptions. Most of us will continue to have day jobs or supportive spouses, or other sources of income. For whatever it might be worth, I do think I’ve found the one constant in this field. It was true when I was trying to break in, and when I finally did, and I think it’s still true now. You have to love what you’re doing. You might make a living at it, you might not. Whether you do or don’t, the only real reason to write what you write is that you don’t have a lot of choice, because you simply cannot count on anything else. Do it for love. It’s the one reason that makes sense. This entry was posted in Publishing, real life, Writing and tagged armor, Medieval Period, SCA by ogresan. Bookmark the permalink. I know the feeling. I am sticking toes in the waters of self-publishing after nearly 40 years of being paid by others. It is kinda scary. It is. And you know it’s not right for everything, but for some projects it makes perfect sense. Regardless, things change. What a person thinks they want for a while might not turn out to be what they want forever. It usually isn’t. Fighting change is like fighting the tides. Even if things didn’t change, we do. So it’s kind of the same thing either way. True words. Well, ideally, you have to like what you do, and its possible that what you most like will change. One of the few things I always like to do (Which began when I was about 5) is aircraft, drawing, and dinosaurs. I knew pretty young that I wanted to fly, and was most disturbed when my eyes went bad. I like to draw – my father was no thrilled with that as he believed only gays did so. (Or mostly, I can’t truly believe he thought all artists were gay). I like studying paleontology, and still do, but not so much. Probably the most constant ‘constant’ is airplanes. When we go to Florida I invariably find an aircraft museum. We are planning a trip to Richmond, VA on 19 Sept. (UCI World bike races) and a few days after that will go back to Williamsburg/Jamestown/Yorktown area. And, of course, I have already located a museum for aircraft. I am in the CAF, and while I don’t fly them I do work on planes – have done sheet metal work on both the B-29 and B-24. (We made a C-87, the cargo variant of the 24, in what looks like an early model B-24. I had several single gun mounts and a belly mount, but no powered turrets). I don’t hunt much. I used to hunt some. I still do some target shooting some. I have a 5.56 one of my friends and I built up, but mostly prefer the M1 Garand or a 308 scoped rifle for long distance. (Anyone can shoot up to 200 yards). No range in this area has a long distance part, and most are indoor, so your limited to pistols and maybe 22 rifles. I do still have my longbow. One of Jennets apprentices came over a couple of weeks ago and I put the first 3 arrows in the center ring, the next one was 2 inches outside – and then the one after that missed the target. Not sure I should be pleased or not – I have not touched a bow in years. Oh well. I need to go plant some fruit trees. Yesterday we bought a key lime, a Meyers Lemon, and some sort of avocado. Last year we planted a satsuma and a pomegranite. The soil here is clay type, so you have to dig out a big hole and mix dirt, mulch, sand and whatever to make the roots really develop. The hardest one to do will the avacado, which says it needs a 4’ wide hole that is 3’ deep. If you want to come down and help dig it, that would be great. Likely not, but I do sympathize. We have the Yazoo clay here, and it’s amazing anything grows at all. I tried a Yoshino cherry tree year before last and even with the big hole and proper soil it was dead in two weeks. Probably from disgust.